“I am astounded at the lack of respect given to my clients in these forums. The Agenda was particularly offensive after the tumultuous events in Somkhele and Xolobeni two weeks earlier and given that we attended a meeting where DMR would finally be listening to grievances of the community. The bias towards the mine was so evident. This immediately made the whole process untrustworthy. What could have been a first-time opportunity for hearing and investigating the suffering and grievances of affected community members as a first step to making amends, instead, it turned out to be an unfortunate waste of everyone’s time and money, which included the expense of flying twenty experts that did not include any other government departments.” – Kirsten Youens, attorney for MCEJO. In support of the Mpukunyoni community, mayor Velangenkosi Gumede of Mtubatuba called for the cancellation of the two day task team meeting at the Umfolozi Protea Hotel on 1 and 2 October. The task team comprised twenty experts. The meeting was organised by the Department of Mineral Resources to address complaints and human rights issues perpetrated by Tendele mine that emerged during minister Gwede Mantashe’s visit to Somkhele last Saturday. The agenda for the meeting gave the floor to Tendele mine and included items that raised sub judice issues pending the outcome of the Pietermaritzburg High Court application that Tendele is operating without required environmental authorisations, land planning and or a waste management licence..
4.Discussion on proposed relocations of the Ophondweni and Emalahleni communities. Before the DMR chairperson could even welcome everyone, members of the community were raising issues with the choice of venue that was so far from Somkhele and not big enough to accommodate everyone. The community complained about the lack of transport that had been made available for them and the personal cost in attending the meeting. The agenda was hotly challenged. The chairperson confirmed that Tendele had paid for the venue and the food. When it became evident there was no possibility of DMR being able to remedy the situation, the mayor conceded that the meeting had been badly planned and was in the wrong venue. He agreed with the community that it should be cancelled. A few members of the community, including Mr Nkosi from the Concerned Group, remained behind to discuss a follow-up meeting and give suggestions on how an agenda should be drafted with the DMR task team and the Mtubatuba mayor and municipal leaders. The community representatives urged DMR not to side with or work hand in hand with Tendele mine to organise the meeting as they did with the abandoned meeting. The DMR task team should liaise with the Mtubatuba municipality, not Tendele mine, as the municipality commonly organises community meetings and informs concerned parties. Mr Nkosi suggested that a new agenda should be drafted by all stakeholders and all community groups and that other government departments must be represented, not only Tendele Coal Mining and the DMR task team. This idea was supported by the mayor who recommended this planning meeting should take place on municipal premises. The venue for the task team meeting should be in the Mpukunyoni community, like the Somkhele sports ground where the previous meeting with the minister took place on 22 September. People from affected villages should be transported to the venue and not have to pay their own transport to attend a meeting called by DMR. 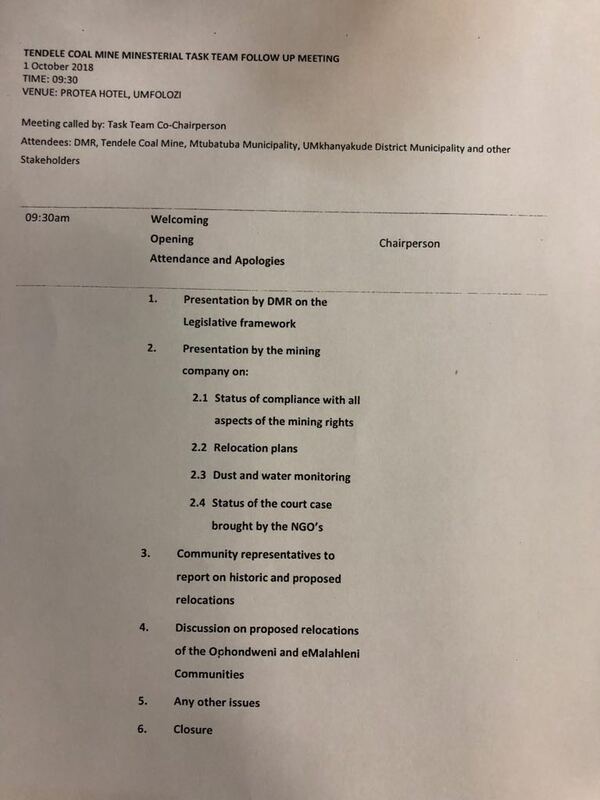 Before the new meeting, Tendele Coal Mining would have to provide the DMR task team with documents with the relevant facts about their previous/current operations and promises made to the community since the mine started operating in Somkhele. Additionally, it was suggested that Tendele mine representatives should accompany the site visits proposed by DMR to witness firsthand the impacts on affected sites/households. The DMR task team should include other departments such as, the Department of Environmental Affairs, Health, Cooperative and Traditional Governance, Water and Sanitation, Education, and other relevant stakeholders. The community representatives handled a potentially tense situation calmly with a strong united voice.